It’s been a quiet weekend for us with me being on call for work and dealing with an annoying cold! Our department has been passing around what seems like a few colds over the last month and it finally hit me. Ick, it’s been awhile since I’ve gone through this much tissue and not being able to sleep well is the worst! But I’m at the tail end of it and will appreciate good health and being able to breath and sleep a lot more now. 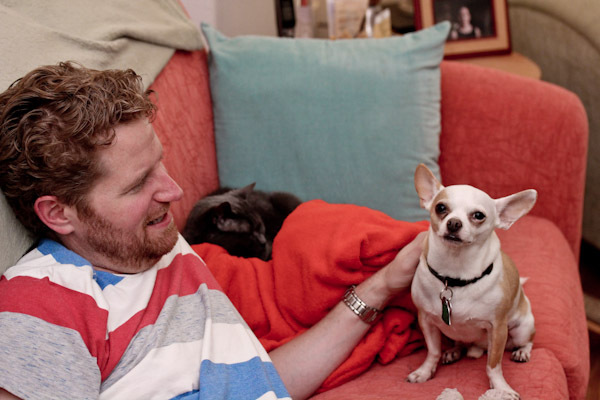 Friday we stayed at home with spicy Thai takeout and relaxed with cuddly pets. 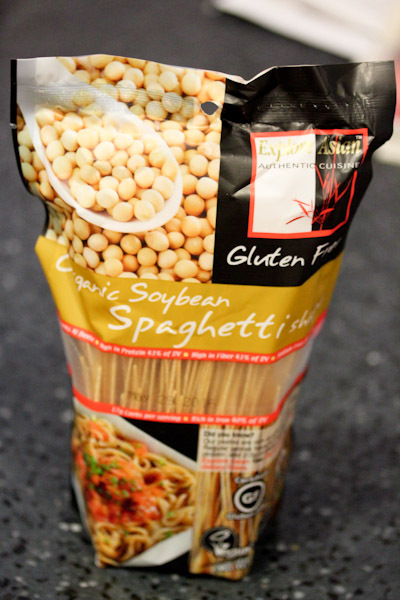 Last night I turned to one of my favorite weekend splurge foods – Explore Asian’s Organic Soybean Spaghetti. Maybe it’s not really a splurge because it’s just two ingredients, organic soybeans and water. 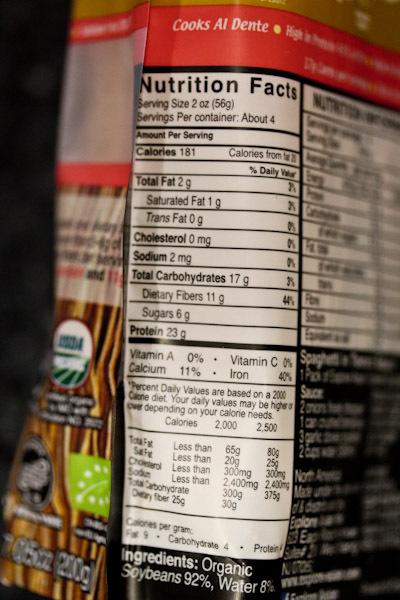 And it has lower calories per serving than traditional pasta and 23 grams of protein per serving! With a lot of fiber, all good things! But it feels like a fun splurge food. I realize I might be slightly obsessed with this spaghetti, but it’s such a fun way to get more protein and so simple to cook. 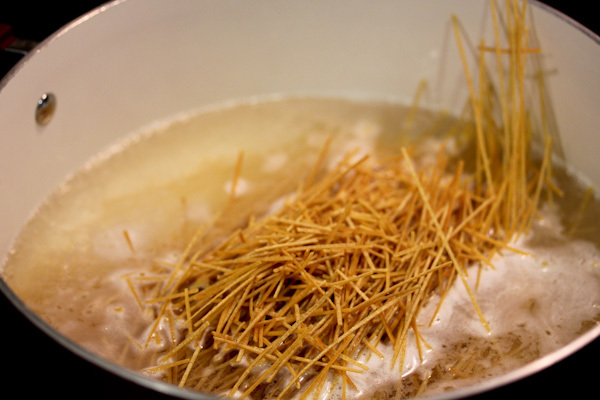 The directions recommend boiling for 7-8 minutes, but the spaghetti hits the perfect texture for me after about 3 minutes. 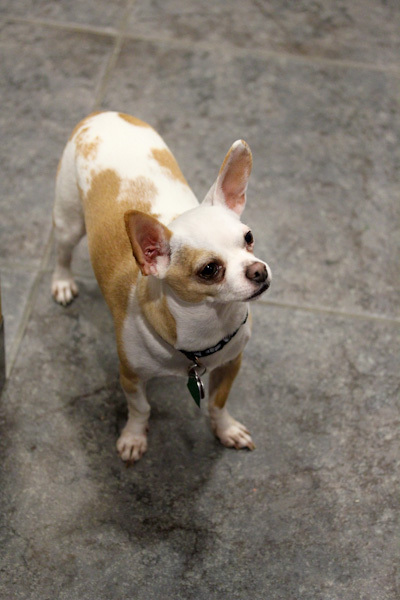 Miko is equally obsessed hovering in the kitchen begging while cooking. 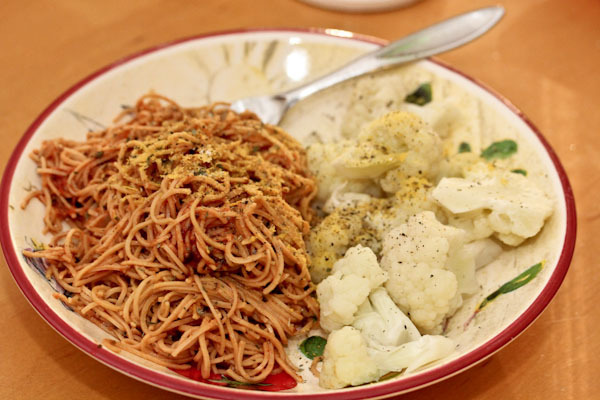 I served the spaghetti with Trader Joe’s Organic Marinara sauce with added seasonings and simple steamed cauliflower topped with nutritional yeast, salt and pepper. Very hearty and filling comfort dinner for a cold. Of course there has been a lot of salads the smoothies this weekend too, green monsters are also a great way to treat colds. Since that wraps up my quiet weekend, on to the fun news. CNN did a quick follow up interview with Dr. Ellsworth Wareham, the 100-year-old heart surgeon and long term supporter of a plant-based diet. He makes being 100 look pretty damn inspiring! Here’s a longer interview with him from 2013 and he’s been on a plant-based, vegan diet since he was in his 50s showing it’s very possible to make a positive health change later in life. And he has a lot of interesting things to say about our ability to change our tastes. Plus there is something calming and soothing about listening to him talk about health and dealing with life challenges while being so laid back. This is a very interesting diet swap comparison showing how much damage a standard American diet can do in a short amount of time. Freebirds World Burrito is now offering a solid vegan option too. This Raw Carrot Cake with Cashew Lemon Cream looks simply divine. So does this Banana Bread Pudding. Forks Over Knives has a great article on eating healthy on a budget of $1.50 a day. POPSUGAR has 33 things to quite in your 30s which are mostly great and true especially 4, 15, and 16. 10 tips for an organic garden. Morrissey takes an impressive stand about serving meat and dairy at a climate change event. Jared Leto maintained his vegan diet while bulking up for the Joker role. Finally, an inspirational story about reversing diabetes and getting off medication through diet. Thanks on the cold and that’s too back about the Explore Asian’s products, I hope not and will be looking into. Dr. Wareham is incredible. If he can’t convince people that eating a plant based diet is the way to go, nobody can. Morrissey is awesome. I’ve loved his music forever, and his honesty is so refreshing. Thanks on the links and agreed on Dr. Wareham, very inspirational! LOVE this brand!!! :) I love that their noodles are so SIMPLE with 1 to 2 ingredients ONLY!!! Agreed, the black bean noodles are also great and I need to try the rest! It is and they have other great flavors too like black bean.